Recently I caught up with State Library of Queensland’s Design Minds team. As I shared some of my experiences at the Cooper Hewitt Smithsonian Design Museum in New York they asked me if I’d like to write an article for Design Online. Contemplating the many experiences and insights I’d gained, one project in particular resulted in a number of those elusive ‘ah-ha’ moments. 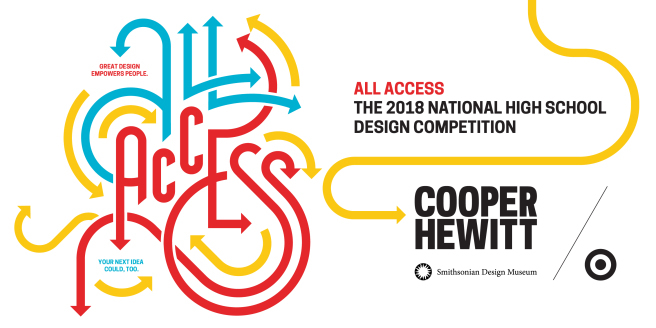 A relatively new addition to the many opportunities organised by the education team at the Cooper Hewitt Design Museum is the National High School Design Competition. Previous years have encompassed chair design and access to fresh food for all. The 2018 challenge requires students to design a solution that made the everyday accessible. I was tasked with the creation of a series of lesson plans, resources and slideshows to scaffold a design process towards competition entries. Being immersed in the ideas around accessibility and design, a number of Ted Talks shaped my approach towards helping students develop empathy and therefore a user-centred design. In particular Sinéad Burke’s TED talk titled Why Design Should Include Everyone explored what it is like to navigate the world at 105 centimetres tall. She shared her awareness of details that are practically invisible to many of us and observed that the designed world – from the height of a lock to the range of available shoe sizes – often inhibits her ability to do things for herself. I realised it was important for students to firstly understand that every object, place or process is designed for a user. People are diverse so designers often make assumptions about the user. For example, they make assumptions about the user’s physical ability, cognitive understanding and preferences. Designers are creative problem solvers who work to improve all aspects of daily life, including designing solutions to eliminate barriers for people of varying abilities. While great strides have been made to design for accessibility, many of our everyday tasks and surroundings still remain a challenge for people with cognitive and physical disabilities. Empathy is developed as a designer endeavours to understand the way a user does things and why, their physical and emotional needs, how they think about world, and what is meaningful to them. Based on this understanding, I incorporated a series of hands-on scenarios into the competition lesson plans. Following this, students consider the advertising trailer created for the 2016 Rio Paralympics. This warm celebration of the talents of those involved reinforced the message that individuals with physical and cognitive disabilities don’t want to be told they can’t, but can live fulfilled lives and achieve just like anyone else. Designers have a responsibility to push the boundaries of problem solving with user diversity in mind. As a teacher and parent I realise that the world view of young people is developing and I have an important role to play in widening this view. Scaffolding opportunities for my students to understand a user’s situation, motivation, needs and values can lead to better design but more importantly a person with a capacity to empathise. I would argue that empathy underpins many of the identified 21st century thinking skills that students will require in all those jobs that haven’t been invented yet. For example, collaboration, communication and creativity deepen when we try to understand another person’s needs and experiences. Creating this series of lessons confirmed to me that empathy is the centrepiece of the design process. This is true of a teacher’s role as designer of meaningful learning experiences. As we consider the diverse motivators and emotional needs of our students then worthwhile learning experiences can follow, potentially enabling empathy towards a future we can all be proud of. Visit the Smithsonian Learning Lab for more resources! This article by Oakleigh State School teacher and 2017 Queensland-Cooper Hewitt Fellow Chantelle Sansness was originally published 19 November 2017 on Discover Connect Create.